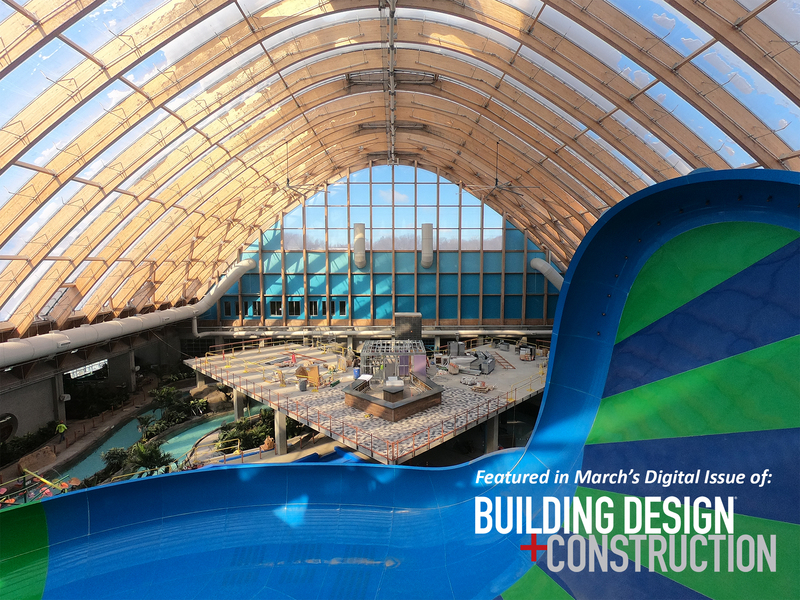 Kartrite Resort & Indoor Waterpark, Featured in "Building Design + Construction Magazine"
ADG’s work on the Kartrite Resort & Indoor Waterpark was featured in the popular online “Building Design + Construction” Magazine this March. This magazine covers design and construction trends, cutting edge projects in the hospitality industry and other architectural advances across the United States. BD+C’s editorial focus is on architects, engineers, contractors, and building owners/developers. Each issue provides the industry story on the process of how significant projects get built, from how Building Teams solve problems and deliver a project on time and on budget to the products and services that enable them to achieve their goals. The Kartrite Resort & Indoor Waterpark was a project that fit the mold of innovative design and construction! The $180-million Kartrite Hotel & Indoor Waterpark is nearing completion in the Catskill Mountains in Upstate New York. The hotel is located next to a 100,000-sf casino and the Monster Golf Course.project will feature 324 guest rooms. Amenities include a bar, a candy store, a coffee shop, four restaurants, a tap room, a family entertainment center with an arcade and indoor ropes course, a conference center, and a spa. Connected to the hotel is a four-season, two-acre indoor water park, designed by Aquatic Development Group. The indoor water park, which will become New York’s largest, includes a FlowRider surf attraction, a lazy river, a kids activity pool with basketball, and a multi-level play structure and slides. Deck space with cabanas, landscaping and vegetation, and a mezzanine that overlooks the waterpark with additional seating and a bar & grill restaurant will also be included. A 60,000-sf Texlon transparent roofing system will cover the entire park and feature column-free construction. The barrel-shaped roof allows sunlight to enter the water park, which will be kept at a steady 84 degrees, year-round. Learn more about the innovative design and construction of the Kartrite Resort and Indoor Waterpark Project today!